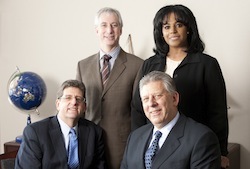 Attorneys and Staff | Bloom, Bloom & Associates, P.C. When you work with the attorneys and staff at Bloom, Bloom & Associates, you receive advice from highly experienced professionals who believe strongly in the value of continuing education. Our attorneys regularly attend seminars to keep abreast of the latest developments in their respective areas of legal expertise. In addition, members of the firm often share their expertise by conducting educational programs for many civic, business and professional organizations throughout the community.